This agreement constitutes as a contract between the Guest(s) and Georgia Mountain Cabin Rentals (GMCR), as the manager for the property owner. Guest(s) hereby understands and agrees that this rental agreement is non-negotiable. Terms and conditions may change without prior notice. RESERVATION REQUIREMENTS FOR GUEST RENTAL AGREEMENT. You must fill out the page 14 of the Guest Rental Agreement and return to our office WITHIN 72 HOURS OF CONFIRMATION EMAIL IN ORDER TO COMPLETE YOUR RESERVATION. You may electronically fill out and sign this document and submit it from any device. The system will not allow you to submit the reservation unless all required fields are signed and/or filled out. 1. All Cancellations must be completed in writing (Email, Fax, or Certified Mail). Cancellations are not considered complete until Guest(s) receives and confirmation from Georgia Mountain Cabin Rentals. Reservations cancelled with less than 30 days notice are subject to a $100 cancellation fee. Reservations cancelled with less than a 15 day notice forfeits the $250 deposit. Reservations cancelled within 10 days of check-in are subject to the entire rental amount. NO SHOWS ARE SUBJECT TO THE ENTIRE RENTAL FEES. Cancellation policy applies to last minute bookings as well. A Cancellation fee of $50.00 will be applied to all voluntary cancellations prior to arrival date that results in any kind of refund. All Cancellations must be completed in writing (Email, Fax, or Certified Mail). Cancellations are not considered complete until Guest(s) receives and confirmation from Georgia Mountain Cabin Rentals. Reservations cancelled within 30 days of check-in are subject to the entire rental amount, this applies to any reservation that occurs over the Thanksgiving, Christmas or New Year’s holiday. Have you read and understand the terms of cancellation? When Guest(s) request to change from one cabin to another there is a $25.00 Reservation Change Fee, this option is only available thirty (30) days prior to the arrival date. Rescheduling of dates may be allowed as long as the Guest(s) stay is rescheduled to the same property within thirty (30) days of the original arrival in date without loss of pre-payment, no rescheduling shall be allowed inside of fifteen (15) days of the arrival date. This is at sole discretion of manager and additional fees may be required. If Guest(s) request to change to a different cabin within thirty of the Reservation Approval, this change is at the discretion of the manager. There is NO guarantee that the request to reschedule the rental will be approved. If approved, the Guest(s) paid amount will be credited to the new reservation, the Reservation Change Fee, will be added to the Guest(s) balance due. If there is any difference in the balance due this will be adjusted accordingly, either up or down. The weather can be very unpredictable in the North Georgia Mountains. This is why GMCR offers Travel Insurance, see section 4. It is the Guest(s) responsibility to monitor the weather and road conditions prior to the arrival and during the Guest(s) stay. Guests may contact the office of GMCR to inquire about conditions. Guest(s) hereby understands that the manager cannot predict weather nor road conditions. Road conditions can change rapidly and can become impassable at any time and stay impassable for any length of time. If weather conditions do not allow Guest(s) to depart on the regularly scheduled departure day and the Guest(s) must “stay over” the regular nightly rate will be charged. It is the Guest(s) responsibility to pay for any additional services needed or requested by Guest(s). Guest(s) arriving during this time and checking in (checking in means acceptance of keys and taking occupancy of the property), understands that they are proceeding at their own risk and should make appropriate arrangements. In case of impassable roads, GMCR will try and accommodate Guest(s) with another cabin of similar type. If it is calling for inclement weather while you are staying with us, please make sure you get all supplies needed in case of power outage (flashlights, matches, extra non-perishable food, bottled water, etc.). GMCR and the individual homeowners will not be responsible for maintaining the conditions of roads, decks and driveways in the event of snow, ice, rain, etc. GMCR will not perform "rescue missions". The guest agrees to take full responsibility for their safety as well as the passengers in the vehicle. The guest also understands that the risk of traveling in inclement weather may result in loss of property, damage, loss of life, etc.. Upon Guest(s) request, a travel insurance policy may be purchased from GMCR, thru a third party vendor, CSA Travel Insurance. This policy may cover any monies lost based on coverage provided. The option to purchase this travel insurance policy must be exercised no later than when the final balance due date for the reservation is, ten (10) prior to arrival date. All eligible refunds will be issued to the credit card on file. There are no cash or check refunds available. Refunds and/or rate adjustments are not made for any inconveniences. There are NO REFUNDS or rent reductions made due to the following: failure of appliances, failure of equipment, early departures, delayed arrivals, inclement weather, or public utility failure or interruption. ALL REFUNDS are subject to a $50.00 processing fee. Inclusive offering: Each Reservation has the option of a $60 policy, from a third party company, or using the Guest(s) own money for a security deposit. This Security Deposit Protection plan covers unintentional damages to the rental unit interior that occur during your stay, provided they are disclosed to management prior to check-out. The policy will pay a maximum benefit of 500.00. Any damages that exceed $500.00 will be charged to the credit card on file. If, during your stay at one of our Rental Properties, an Insured Person causes any damage to real or personal property of the unit as a result of inadvertent acts or omissions, the Insurer will reimburse the Insured for the cost of repair or replacement of such property up to a maximum benefit of $500.00. Certain terms and conditions apply. Full details of the Security Deposit Protection coverage are contained in the Certificate of Insurance or Insurance Policy. The Security Deposit Protection can be purchased up to, and including at, check-in. Please contact GEORGIA MOUNTAIN CABIN RENTALS directly if you do not wish to participate in this plan or assignment. Guest(s) may choose to “Self Insure” for the security deposit. This means at the time of the reservation the Guest(s) may choose to put down their own $1,500.00 security deposit. This will be charged to the Guest(s) credit card on file at the time that the reservation is made. Upon Guest(s) exiting the cabin, the manager, will within 48 hours inspect the property to ensure quality for damage and wear and tear. If something is found to be not “in good working order” the amount of money shall be deducted from Guest(s) security deposit and the remainder shall be refunded back to Guest(s) credit card on file. If the damages exceed the $1,500.00 security deposit, the Guest(s) shall be 100% responsible for excess monies. Guest(s) may be charged also for travel, time, and transportation fees incurred by manager in order to make necessary repairs or replacements due to Guest(s) damages. Since a “Refund” is included in this security deposit, it will fall under all categories of any other refund, and is subject to a $50.00 processing fee, in addition to any damages, if there are no damages determined by manager there still shall be a $50.00 refund processing fee. In order to reserve a property, you must pay a $250.00 down payment at the time of the reservation. This money is a payment towards the entire rental amount. This is a down payment and is not related in any way to a security deposit. Please see Section 6, regarding security deposits. Final payments are accepted by personal check (all personal checks must clear the bank account of GMCR ten (10) days prior to arrival date, all check payments should be mailed to Georgia Mountain Cabin Rentals PO BOX 2501 Blue Ridge, GA 30513), debit cards, Visa, Mastercard, American Express, or certified finds. A $35.00 service charge will be incurred for any returned checks and all money owed will be charged to the credit card secured by GMCR at time of reservation. A valid credit card will be on file at all times for the security of the property. In the event of misuse, guest neglect, or damages arising from misuse, Guest(s) hereby authorizes GMCR to apply payment to the valid card in order to cover and damages, repairs, and other expenses incurred due to misuse of Guest(s). Once a reservation has been made and the $250.00 down payment has been received, Guest(s) will receive and email of the confirmation of reservation. After receiving the confirmation it is the Guest(s) responsibility to ensure the accuracy of the reservation. All errors should be reported to GMCR within twenty-four (24) hours of receiving the confirmation email. Guest(s) shall also read the Guest Rental Agreement (GRA) and it is Guest(s) responsibility to notify each person in the Guest list and that everyone in the party understands the Terms and Conditions. A copy of the last page must be returned to the office of GMCR with 72 hours in order to hold the property for the reservation. Nightly rates and minimum night stays on shown on each individual property listing. These rates do not include any taxes or additional fees. Nightly rates are subject to change without notice. Once the Guest(s) receives a confirmation of reservation email, the rate will not change, unless there are additions or subtractions made by the Guest(s). Manager may offer different types of promotions and savings at different times of the year. These are based on occupancy, seasonality, and may be adjusted at last minute. Once Guest(s) has completed a booking the reservation cannot be changed. Any specials must be asked for and applied at the time of booking. Some properties may be exempt from specials. Check in time is at 4:00 PM. This means that the Guest(s) can arrive at the office of GMCR at 4:00 PM to get the keys and directions to the property. HOWEVER, keys are not given out to the property until the property is ready to be occupied. Manager will use every possible resource to ensure that the property is available by the standard check in time, however due to possible interruptions manager cannot guarantee the exact time of occupancy. No concessions, rate reductions, or refunds will be made for postponed occupancy due to conflicts that may be out of the manager’s control. Check out time is at 11:00 AM. This means that the Guest(s) must leave the property by 11:00 AM and bring the keys back to the office of GMCR. Check out times are strictly enforced in order to have adequate time to have the property ready for the next occupant. All items on the “Check Out List” provided by the manager shall be completed prior to leaving the property. Failure to complete the list shall result in additional charges for additional housekeeping. There are options for early check ins and late check outs, provided that the property is open and available for these times. Please contact the office to see if property is available for either of these desired options. Additional fees may apply. Guest(s) must contact the office of GMCR as soon as possible in order to extend the Guest(s) stay. The current rate will apply to any additional nights requested or “Held Over” by Guest(s). Reservations must be made by responsible persons over the age of twenty-five (25). The reservation holder must be in attendance during the reservation. The Guest(s) whose name is on the reservation will be responsible for the entire party and the property that has been rented by Guest(s). The house is only advertised to hold a maximum number of people, this includes adults and children. Occupancy limits are strictly enforced, NO HOUSEPARTIES allowed. Any Guest(s) in violation of this policy shall leave the property and all monies shall be forfeited. A visitor of the Guest(s) may be allowed to occupy the property on a temporary basis. Visitors may not occupy the property beyond 10:00 PM at night and may certainly not sleep in or on the property. If visitor does stay the night the Guest(s) must notify the office of GMCR and pay the additional Guest charge. ALL visitors must be on the Registered Guest List and be noted as only being a visitor. Pets are only allowed at properties that allow pets. ALL pets must be prior authorized by GMCR and a non-refundable pet fee of $62.50, plus tax, will be charged per pet for the entire stay. No more than two (2) pets are allowed to occupy the property at any time. In this agreement the word “Pets” refers to dogs only. If a pet is found to have been in a cabin that is not “Pet Friendly” there will be a $250.00 charge for failure to obey the policy. Pets are not to be left unattended at a property, unless they are crated. Guest(s) must bring their own crates. Guest(s) are responsible for the actions of their pets and all damages that may arise from having a pet on the property. GMCR, managers, nor home owners assume any responsibility or liability for Guest(s) pets. If a property becomes unavailable prior to occupancy outside of Manager’s control or prior knowledge due to termination from rental program, major mechanical failure or loss, loss of utility, Manager shall have the right to move the Guest(s) to a different property that is comparable to originally reserved property. If no comparable property is available Manager can offer to reschedule to another date, or issue a credit towards another rental property in the same amount that the Guest(s) had already paid. If there are not any options from the company of GMCR, then GMCR can issue a full refund to Guest(s) without penalty. Any refund due to this shall only be as much as the original amount paid by Guest(s). In the event this happens, no other claims can be made by Guest at any time, present or in the future. Manager shall have the sole right to move Guest(s) to another property as long as it accommodates the number of Guest(s) on the Guest Rental Agreement. All properties are privately owned and have different subscription package for cable and/or satellite. GMCR does not guarantee any programs or events. The cabins have been equipped with detailed instructions for proper use of the television. There will be no refund for TV disruption. Satellite TV Systems: Guest(s) will be charged for any Pay Per View Movie that is watched or attempted to receive during the dates of the Guest(s) reservation. These transactions do show on owners billing statements. There are blocks on the systems to try and prevent this. If Guest(s) wishes to get a PPV program, please contact the GMCR office and the Manager will help Guest(s) to arrange this. All properties are privately owned, furnished, and equipped by Owner of property. As such, Manager cannot make changes to any furnishings or equipment in the property without prior consent of the owner. Your cabin will be inspected prior to your arrival to make sure mechanical and non-mechanical items are working. If something is not working please call us at 1-877-656-7368. If a Guest(s) requires a special appliance or equipment it is the Guest(s) responsibility to either bring them or let the Manager know that any item is requested. Any item requested by Guest(s) may be at Guest(s) cost. A property may have a locked space that is for private use. In this locked space may be Owner belongings, cleaning supplies, and other private items. This space, nor these items are included with the Guest(s) rental of any property. Guest(s) agree not to tamper with locked areas. In the event a locked area is tampered with, Guest(s) shall be fined a minimum of $100.00, and any additional items that may be broken of missing from the locked area will be charged to the Guest(s) as well. All property information and property listings are believed to be accurate and true. Manager has made every attempt to ensure that an item listed is indeed at the property and in good working order. The possibility of Errors and Omissions do exist. If you have a question about a properties contents please feel free to contact the office of GMCR and inquire. If there is an item listed, and Guest(s) arrive at property and item is not there, or is not in good working order, please contact the office of GMCR immediately. Guest(s) will be provided, at the time of check in, a phone number for any issues that the Guest(s) may have during their stay. This number can be used for after hour emergencies, questions, or issues that may arise at the property while Guest(s) has occupancy of the property. IF THERE IS AN EMERGENCY PLEASE CALL 911. If your request is a non-emergency it may be forwarded to the office of GMCR on the next business day. All emergencies will try and be addressed in a prompt and with thorough care. If Guest(s) calls and does not get an answer the Guest(s) should leave a message. In the mountains, the “on call” service person may be out of cellular service, and this way the call can be answered as soon as “on call” personnel is back in range. Guest(s) must report any inoperative or broken equipment to the office of GMCR, in a timely fashion. Manager will make every attempt to repair any inoperative or damaged item that is reported to the office of GMCR between the hours of 9:00 AM – 5:00 PM Monday-Saturday on the same day. Our office is closed on Sunday but there is still an “on call” team member available. Manager will make every reasonable effort to have repairs completed in an efficient manner. Manager does reserve the right to move the Guest(s) to another property in the event that the Manager, or sub-contractor of Manager cannot fix the item in a reasonable time or manner. Guest(s) understands and agrees that Right of Entry for Manager, staff, sub-contractors, or any repair personnel shall be granted by Guest(s) at any reasonable time in order to make necessary repairs. Guest(s) understand that GMCR cannot guarantee against mechanical failure of heating, air conditioning, Hot Tubs, TV’s, and Satellite Receivers, VCR’s or other appliances or systems. Please report any inoperative equipment to the office immediately. Agent will make every reasonable effort to have repairs completed quickly and efficiently or may move Guest(s) to another cabin if possible. Should a repair technician make a call to a cabin and find that the equipment is in working order and the problem was due to the Guest(s) oversight or neglect, the charge for the service will be at the Guest(s) expense. No refunds or rent reductions will be made due to failure of appliance and/or equipment. Guest(s) are encouraged to call the offices of GMCR to report problems or issues that Guest(s) are encountering. The office or the after-hours on call personnel will try and walk Guest(s) thru issues that Guest(s) are encountering, if this does not work or satisfy the Guest(s) and if Guest(s) causes a service call and a technician is dispatched to the property and the technician finds that the equipment is in good working order and/or the problem was due to Guest(s) oversight or neglect, the charge for the service will be at the Guest(s) expense, and will be charged to the reservation total, and Guest(s) will receive an emailed copy of receipt. During business hours, the minimum charge is $25.00 and after hours and on weekends the minimum charge is $50.00. Guests will receive one set of keys to the property that the Guest(s) has reserved. One additional set ok keys may be requested by the Reservation Holder only, if necessary. All Rental Keys need to be returned to the Office Drop Box upon departure. The properties are privately owned and the Guest(s) are responsible for lost, misplaced, or stolen keys. The property must be re-keyed in the event that key(s) are lost, misplaced, stolen or not returned for any other reason. The Guest(s) will be responsible for the cost of property being re-keyed. In the event a Guest(s) is locked out of the property, a key can be borrowed by coming to the Georgia Mountain Cabin Rentals office. After business hours, the Guest(s) must call Georgia Mountain Cabin Rentals emergency number. A representative will assist, by providing a spare key. A charge of $25.00 is payable for obtaining the key after business hours. Some properties are equipped with games, gaming tables, and electronic games, and are in place for every Guest(s) enjoyment. It is the Guest(s) responsibility to ensure that all pieces and gaming equipment is in good working order upon the Guest(s) departure of the property and that all games are returned back the their respectful place. Pool Tables: Some of our cabins have pool tables. There will be a $25.00 charge to replace broken pool sticks. If the felt on the pool table is damaged, there will be a $400.00 charge to replace the felt. Please be very careful when playing pool, so that other guests may enjoy the use of the table too. All properties are equipped with a land line telephone. Guest(s) agree to make all long distance calls with a calling card or by calling collect with the assistance of an operator. No long distance calls can be made from the rental property’s phone. Some properties offer internet use for the Guest(s) of the property. This internet service is included in the nightly rate for the property. Internet at a property should never be used for any illegal activities. If illegal activities are found to have been used while the Guest(s) had occupancy of the property, the proper authorities will be contacted and Guest(s) may be prosecuted to the fullest extent of the law. Manager cannot guarantee that the internet service will work without interruption, outside of Manager’s control. If the internet does become disabled please count the office of GMCR, and the proper repair technicians will be contacted. There will be no refunds or rate adjustments due to internet not working properly, that is beyond Manager’s control. Under no circumstances should Guest(s) ever unhook electronics or any other operating system in the property without the consent of the Manager. Do not adjust, attempt to re-wire, connect, or disconnect any items that are in place upon Guest(s) arrival. In the event Guest(s) causes this to happen Guest(s) will be 100% responsible for any technician’s calls and service charges incurred. Hot tubs are not to be used as swimming pools, but only to be used for relaxation purposes and not in more than 15 minute intervals. Women who are pregnant or think they may be pregnant should not use the hot tub; children under 12 years of age, or anyone with a known heart condition or any health issue should NOT be in water with temperature higher than 98 degrees for over 15 minutes. The excessive heat can cause damage to an unborn baby, collapsing of heart valves in young children, strokes and heart attacks to someone with an existing heart defect. The chemicals and excessive heat from over use can cause skin rashes, fever, and ear infection in anyone. 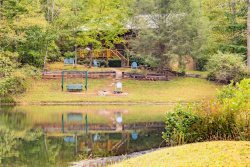 Georgia Mountain Cabin Rentals and the Cabin Owners are NOT responsible for injuries, accidents, medical problems or medical bills. All hot tubs are drained and cleaned in between each Guest(s), then are refilled with fresh water, and chemicals are used to stabilize water. The cover must be in place and latched when the tub is not in use. Children under the age of 18 should not be left unattended, or without adult supervision while in hot tub. Temperature should never be placed over 104 degrees F. PETS ARE NEVER ALLOWED IN A HOT TUB. Do not use any kind of oils or bubbles in hot tub. Indoor Gas Log Fireplaces – Some properties have indoor gas fireplaces, Guest(s) SHOULD NEVER REARRANGE OR TAMPER WITH GAS LOGS, BURNERS, OR PILOT LIGHTS. This is a major safety issue and could be hazardous to your health. Gas log fireplaces are only in operation from the months of September 1 -April 30. These are not in operation during the summer months. Guest(s) should never turn off the pilot light on the fireplaces. If Guest(s) does turn off pilot light and a technician is called to relight pilot light, Guest(s) may be charged a service call charge, due to turning off the logs. Wood Burning fireplaces - Wood is provided for all INTERIOR wood burning fireplaces. Firewood is only provided from the months of September 1-April 30 Firewood is not provided for any outdoor use at all. Always start with a small fire and build up to a responsible sized fire. Make sure flume is open in order to let all smoke out. If Guest(s) chooses to clean out ashes, please make sure they are completely cool and are properly disposed of. Outdoor Fire Pits – Only cabins that have pre built outdoor fire pits are to be used. Guest(s) may not create a new fire pit anywhere on the property. Wood is not provided for outdoor fire places or fire pits. Guest(s) must purchase wood for this. Wood can be found in many places in town like gas stations and grocery stores. Remember to always make sure fires are extinguished properly before being left unattended. A full supply of linens will be provided to each property prior to the arrival of the Guest(s). If the Guest(s) arrives at the property and proper linens are not in places it is the Guest(s) responsibility to notify GMCR immediately. Loss of any linens due to being misplaced from the property, soiled beyond repair, or damaged will be charged to Guest(s). For each property the following will be equipped in the cabin. One (1) set of sheets per bed will be on the bed and made, One (1) large bath towel per person that the property sleeps, one (1) hand towel per person that the property sleeps, one (1) wash cloth per person that the property sleeps, one (1) bath mat per bathroom that has a shower. These linens are of good quality and shall have the following replacement costs charged to the Guest(s) if there are any replacements. If the Guest(s) has the Damage Protection Waiver and the damage to a linen is incidental, this insurance may cover the replacement cost. If Guest(s) chooses to “self insure” for the security deposit, the costs of any and all replacements will be deducted from the security deposit and the remainder will be credited back to the Guest(s) credit card on file. All prices are per piece and are subject to all applicable taxes. Changing of linens are not done during the Guest(s) stay unless requested by Guest(s). There is an additional charge for this service. The charges will vary based on property size and occupancy of property. Please ask the office of GMCR for this service and pricing. No linen should be removed from property for any reason, used for cleaning purposes, or used outdoors. These items are strictly prohibited for recreational purposes on the rental property. If any evidence is discovered that Guest(s) have used these items on the rental property, Guest(s) agrees and understands that they will be fined up to $500.00 or more, depending on circumstances, per instance. Guest(s) will also be responsible to pay for and/or repair any damages associated with the use of these items. ATV’s should NOT be stored on the rental property or used on the rental property at any time. The Guest(s) agree to hold Georgia Mountain Cabin Rentals and the cabin Owners harmless against any and all claims, damages, suits, causes, or action of damages arising from injury to a person or property, or loss of life sustained in or about the cabin and streets in front of or appurtenant thereto by any person or persons whatsoever. Georgia Mountain Cabin Rentals and the Cabin Owners shall not be liable for any personal injuries or damage to any goods, wares, or property, regardless of how such injuries of damages may be caused. Any claims due to improper construction, maintenance, or gross neglect will be secured by the required Liability Insurance of the Homeowner. GMCR has a STRICT NO SMOKING POLICY. Guest(s) are not to smoke inside any property managed by GMCR. Guest(s) are permitted to smoke on the outside of the property and Guest(s) must dispose of any materials in ashtrays or properly designated areas. DO NOT SMOKE IN HOT TUBS, AROUND PROPANE GRILLS, OR PROPANE TANKS. There is a minimum of a $250.00 fine if there has been found to have been any smoking inside a property. All cigarette butts should completely extinguished and disposed of properly and in an outside trash container to prevent smells inside the property. This agreement shall be governed by and interpreted in accordance with the laws of the State of Georgia and shall be treated if this agreement was executed in in the State of Georgia, and in the County of Fannin. Any claims/suits that may arise from Guest(s) experience with GMCR, shall be controlled in the State of Georgia, and in the County of Fannin, in the Fannin County Superior Court. This is to be the case regardless of Guest(s) county and state of residence. Guest(s) specifically consent to jurisdiction. GMCR, serves as the agent & representative of all property Owner(s) in its rental program, and is acting at all times, in and for the best interests of the property Owner(s). Guest(s) hereby acknowledge the right or GMCR, or any representative of GMCR, has the right to enter the property at any time for inspection of property, for any reason. Neither Owner, GMCR, or Manager shall be liable for events beyond their control. If any event arises that interferes with Guest(s) stay, including to but not limited to; acts of nature, governmental agencies, fire, strikes, war, inclement weather, acts of God, and noise from other properties there will be NO REFUNDS offered for these situations. Owner, GMCR, and Manager will make every attempt in their reasonable power to help Guest(s) but make no guarantees that remedies will be made. Any illegal drugs and/or underage drinking is absolutely prohibited and will result in eviction, and reported to proper authorities. Kegs are not permitted on any property. The local police authorities will be contacted should GMCR have to enforce any of the above here-in mentioned activities. House parties are strictly prohibited. If there are complaints from any neighboring properties Guest(s) will be notified. If there is a second complaint the local authorities will be called and Guests(s) may be evited with NO REFUND GIVEN for shortened stays. There are to be no more people at the property than on the registered Guest(s) list. If additional people are found, the Guest(s) may be forced to leave the property and the entire party of Guest(s) may be evicted. Guest(s) shall only park in designated areas for each property. Guest(s) shall not park any vehicle, trailer, or any other personal property in any adjoining property that is not owned by same Owner of property that Guest(s) is occupying. If there is not enough parking for Guest(s) at the property, Guest(s) are encouraged to find another location to park extra vehicles, trailer, or personal property and “car pool” back to the property. Guest(s) shall not park in any portion of yards at properties. This is due to septic systems and underground water lines that may not be seen. If Guest(s) become stuck in a driveway it is Guest(s) responsibility to contact a proper towing service to assist in Guest(s) becoming un-stuck or pulled out. Due to the insurance coverages, GMCR, Manager, or Representative of GMCR are not allowed to hook to, help push, or drive a Guest(s) vehicle. GMCR, Manager, or Representative of Manager may terminate this Agreement at anytime, if Guest(s) violates any of the conditions set forth herein. Upon notice of termination of this Agreement, Guest(s) shall vacate the Premises immediately and forfeit all rents. A material breach of this Agreement by Guest(s), which is in sole determination of the Manager(s), results in damage to the Premises, personal injury to Guest(s) or others, a breach of the peace, a nuisance to others and/or a violation of criminal law or local code, shall be grounds for termination of Guest(s) tenancy. Violation of any of the rules contained herein will result in IMMEDIATE EVICTION AND FORFEITURE OF RENT. NO REFUNDS WILL BE GIVEN DUE TO SHORTENED STAYS. If Manager must obtain legal advice or counsel for matters arising from payment discrepancy involving a Guest(s) or Vendor Payment(s) such as a credit card company, Manager will seek rightful payment and/or collection. If disputes are transferred from Manager’s office to a collection team and/or attorney, Guest(s) of record will become responsible for all charges proved to be their responsibility including cost of collection and/or legal services. Some properties in GMCR’s rental program may become for sale. The Real Estate Broker has been instructed by the office of GMCR that they are not to show these properties while occupied by Guest(s) without consent from Guest(s). The office of GMCR may contact Guest(s) to authorize a viewing, Guest(s) do not have to allow prospective Buyer’s into property. If for any reason a Licensed Real Estate Broker or Sales Person, shows up at property unannounced, Guest(s) does not have to allow them entry, and Guest(s) shall tell the unannounced party to contact the office of GMCR immediately. If a property sells prior to a Guest(s) arrival and is no longer in the rental program. Please refer to section 18, 1, under “Availability”. Swimming – Swim at your own risk. Always wear a life jacket while in the water. No life guard on duty. Stay away from moving boats at all times. Always use a ladder to get back onto the dock – do not attempt to get onto the dock without use of a ladder. Do not place hands, feet or any part of body under platforms or docks as there are sharp objects and metal underneath the docks. Quiet hours begin at 10:00 PM and end at 8:00 AM at all properties managed by GMCR. The cabins are not child proof, and extreme caution must be used when children are occupying the premises and especially playing outside near the woods or in or around the hot tub. Guest(s) understand that it is the Guest(s) responsibility to watch after any child that is on the property and all children must be on the Registered Guest List, regardless of age. Guest(s) understand that the rental properties are in the mountains and there is many different forms of wildlife in the area. Ladybugs can be a nuisance during certain times of the year, and though ladybugs may be a nuisance, NO REFUND will be made for this. Black Bears are in the mountains, and caution should be taken when hiking in the outdoors. Other pests such as wasps, spiders, bees, scorpions also live in the mountains and are near the rental properties. Each property has a regular pest control service, but GMCR nor the owners can guarantee against Guest(s) seeing any animals or pests during the occupancy of the Guest(s) stay. If Guest(s) have an issue with pests or wildlife at the property please contact the office of GMCR. Manager will do it’s very best to try and remedy problem, however Guest(s) understands that any pests and wildlife are certainly beyond the control of Owner, GMCR, and Manager. There will be NO REFUNDS for pests or wildlife encountered. Do not leave food in the garbage containers outside, for this may attract the bears or other wildlife. Each property has a certain cleaning fee that is charged to Guest(s). This cleaning fee is based on the size of the property, and is the same regardless of the number of Guest(s) that occupy the property. The cleaning fee is not refundable, and shall apply to each Guest(s). Guest(s) acknowledges and understands that just because Guest(s) are paying a cleaning fee that Guest(s) are not allowed to leave any property in an unsanitary condition of any kind. Guest(s) acknowledge also that it is Guest(s) responsibility to ensure that all items on “Check Out List” are completed prior to Guest(s) departure from property. The “Check Out List” is provided to each Reservation Holder at time that keys are obtained to property. If Guest(s) leave property in unsanitary condition, in disarray, or have moved furniture photos will be taken and Guest(s) will be charged accordingly to the same credit card on file. This charge may vary based on time to clean, extra trips to property, and any other expenses incurred due to Guest(s) failure to comply. Georgia Mountain Cabin Rentals and the Cabin Owners will not be held responsible for lost or stolen items or items. If we find any “regular” item left at cabin Georgia Mountain Cabin Rentals will email once. We will then send the “regular” item through mail if requested at guest expense. If a gun is left at the property and taken into possession by GMCR, Manager, staff, or cleaning personnel, the Guest will be notified by the office of GMCR. All guns that are sent back to the owner of the gun will be taken to a local FFL Dealer. It is the responsibility of Guest(s) to have a receiving FFL Dealer to have the firearm shipped to. Any expenses incurred are all the liability of the Guest(s). Any drugs, whether prescription, or not, once found by GMCR will be disposed of. GMCR will not mail any drugs to any Guest(s). If illegal drugs or paraphernalia are found on the property after Guest(s) departure, local authorities will be call and Guest(s) information will be turned over to authority as well. Any unclaimed abandoned property will be donated or trashed by GMCR after thirty (30) days of Guest(s) departure from when the item was found. By submitting a reservation over the internet or by phone, Guest(s) has entered into a binding contract outlined by the Terms and Conditions of this Agreement. Upon submission, Guest(s) are authorizing Georgia Mountain Cabin Rentals to bill charges relating to the rental and use of property. Guest(s) accepts and understands that all liability and costs associated with damage due to Guest(s) negligence, misuse of property and/ or missing items is Guest(s) responsibility. Additional charges will be billed to the Guest(s) credit card on record. All credit card sales are final. Guest(s) understands and agrees to the Cancellation policies (Section 15) and Refund policies (Section 17) outlined herein. Any further notices or additional information will be provided upon arrival. Guest(s) signature will be required before taking occupancy. To finalize reservation, fill in the information below and push the “Agree and Sign.” Any further notices and/or additional information will be provided upon arrival. THIS AGREEMENT MUST BE SIGNED PRIOR TO GUEST OCCUPANCY.ALL CANCELLATIONS MUST BE MADE IN WRITING, E-MAIL, FAX or CERTIFIED MAIL. Management requires that ALL Guest(s) and/or Occupant(s) names are registered with Manager’s office. Manager’s office requires first and last names of all Guest(s) and/or Occupant(s) including adults and children, who will be at the cabin, at any time, during Guest(s) reservation dates. This information is required prior to Guest(s) arrival. Guest(s) and/or Occupant(s) may be added or removed by contacting the Manager’s office. If unregistered Guest(s) and/or Occupant(s) are found to be at property guest will be asked to leave the property and all monies shall be forfeited.